Congress President and UPA Chairperson Sonia Gandhi while speaking to allies at a dinner to mark the completion of three years of UPA-II on Tuesday acknowledged that the UPA can secure another mandate only on the basis of the works done by it and not promises. "I know these are difficult times but this is no reason to feel depressed. 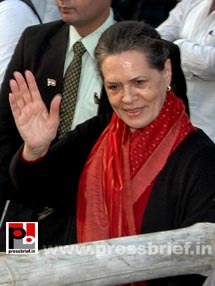 We faced a lot of challenges in the last year inside and outside the Parliament,” said Sonia Gandhi added. Sonia Gandhi continued, “The achievement of UPA 2 is unique. MNREGA became more effective in UPA 2 while there was expansion of health insurance. It also helped the people in the unorganised sectors. The farming sector also became much more organized. Loans to farmers have been increased,” the UPA chairperson said. “We are determined to remove the difficulties of women and the economically weaker section. We are united to progress economically,” Sonia Gandhi said. "We are also committed to protect our secular values, she said adding that it is vowed to remove the problems of women and weaker sections of society. “We could introduce a new social concept and could give a new direction,” she said while starting her address. "UPA-II worked for the all sections of the society. Our Prime Minister explained our achievements in detail and so I will mention only about some of the points" added Sonia Gandhi. Attacking the opposition as aggressive and irresponsible Sonia Gandhi said, “The opposition has been making very aggressive and irresponsible statements against us. But we were committed to our social service. We are focussed on progressive politics. We have always maintained etiquette and we know that we have a mandate to fulfill and we will do that. We have been trying to fulfill the expectations of the people who had reposed their faith on us,"
Congress President and UPA Chairperson Sonia Gandhi while speaking at a dinner to mark the completion of three years of UPA-II on Tuesday acknowledged that the UPA can secure another mandate only on the basis of the works done by it and not promises. She said the Centre is funding the states much more than ever before. “The Centre is financing the states in a record manner so that bigger goals can be achieved,” Sonia Gandhi said. "We have always shown our determination and collective goal. These days, there is a notion that there are several challenges for India's development. Definitely it is a tough period for all the countries and we are not an exception. But there is no scope for disappointment," she said. "We are together in ensuring the positive economic growth rate of the country," she added. She said since UPA took charge of the government, India has been advancing on the growth map in a sustained manner because of which it has been able to provide money for projects of social and rural development. "Because of this the Centre has been able to give that kind of financial assistance to the state government which was never seen earlier," Sonia Gandhi said. She also stressed that the government has to sustain the momentum of this development. "We are aware that only two years are left when we will be seeking a new mandate from the people. We are fully aware that the result of that will not depend on our promises but on the nature of work done by us," she said. “We should continue our committed works to ensure the happiness and progress of the entire people in the country” concluded the Congress President. Congress President and UPA Chairperson Sonia Gandhi attended the first anniversary celebrations of the third term of the Congress government in Assam. She congratulated Tarun Gagoi government in the state for the overall development and prosperity in the state. Sonia Gandhi said that today is a day of celebration for the Congress party. 'But at the same time we realise the huge responsibility the people of Assam has reposed in us and we renew our pledge to serve them better to take them on the path of peace, development and prosperity,’ she reminded. “I am very happy to be here in Assam and this occasion is more memorable as we celebrate the first anniversary of the third successive Congress-led government under the leadership of Taru Gagoi in the state. This proves that the people continue to trust us. We also realize that we have now the increased responsibility to serve people with more dedication and commitment,” added the Congress President. Addressing a mammoth gathering at Moradabad recently which is famous for its famous brass industry – which is also called "Brass City" or Peetal Nagri, Congress President and UPA Chairperson Sonia Gandhirequested the people to put an end to the bad state of affairs in Uttar Pradesh and also requested to support Congress to form a Congress Government in the state to bring back the post pride of Uttar Pradesh. Sonia Gandhi said, “Now we should change this state of affairs. Congress is fighting this election with an agenda of bringing back development in the state. The long history of service and commitment of Congress is well known. Congress had lost elections in the past. But the people re-elected Congress without much delay as they acknowledge our performance”. “You know that the Congress led UPA Government under the leadership of Dr. Manmohan Singh has been in power at the Centre since 2004,” added the Congress President. Sonia Gandhi also had explained the Congress led UPA government’s policies for the welfare of the poor as well as the schemes for the women and minorities. Sonia Gandhi assured that only Congress can transform Uttar Pradesh. “For the past 22 years the misrule by the non-Congress parties ruined the state of Uttar Pradesh. Development reached a stand still. We should now change this” claimed the Congress President. Sonia Gandhi continued, 'We are aware of the situation at the time we had formed our first government in the state eleven years back. Assam was in a state of chaos and disarray. Insurgency was at its height, the treasury was empty, government employees were not paid salaries, development was at an all-time low, industries and industrialists were fleeing. There were no proper roads, adequate electricity and it was rampant anarchy across the state. The people were scared to move out of their houses after the evening”. Explaining about the efforts of the Congress government, the UPA Chairperson said “Soon after the Congress Government took charge of the state, it took immediate measures to solve these problems. I feel very happy today to see the changed face of Assam. We could achieve this because of the combined efforts of the Congress-led government and the people in the state. I use this occasion to congratulate Tarun Gagoi, his colleagues, Congress workers and leaders and the people in Assam in particular for this remarkable achievement”. Expressing her happiness in the state of affairs in Assam, the Congress President said “Assam is moving forward through the path of development, prosperity, peace and brotherhood. We witness a confident Assam today”. '“Assam's strength is in its diversity and the people of the state have realized that it is Congress that will take all sections of society into consideration in the development process” further said the Congress President. “The Congress-led government understands the expectations of the entire people. It always tried to protect the pride and honour of the entire communities in the state. Congress never works, or will work, for any particular caste, religion or region. The Congress led government in Assam could ensure a secured future of the state and its people” she added. Recalling Rajiv Gandhi the UPA Chairperson continued, “'Rajiv Gandhi had realized this 27 years ago when he signed the historic Assam Accord and we are still working according to its provisions. Our Prime Minister Manmohan Singh has been representing Assam in Rajya Sabha since last ten years and he shows special interest for the welfare of Assam. We know that Brahmaputra river is the lifeline of the state and an integral part of its cultural identity. We also understand the hardship being faced by the people in crossing the river and we are soon going to have about four bridges across Brahmaputra”. Narrating the achievements of the Congress-led Government in Assam Sonia Gandhi said, “There has been a marked improvement in the condition of roads while there has been increased investment in the power sector. Eight lakh BPL families have been provided with electricity under Rajiv Gandhi Grameen Vidyutikaran Yojana. Several new schemes have been undertaken for empowering women like strengthening of self-help groups and under Panchayati Raj women were given reservation of 50 per cent. For the development of all sections of society including SC/STs, backward castes, indigenous communities, the government has set up eight autonomous councils and 18 development councils. Assam has also taken full advantages of National Rural Health Mission. I have been told that the people are receiving much better health care and facilities”. “We want fast economic growth and better development in the country and we wish that the entire people avail its benefits. We also look for a safe and secured environment” she added. Sonia Gandhi further said “People of the state have strongly supported the Congress in all possible manner and the Congress government in the state will never disappoint the people in making Assam one of the developed and peaceful states in the country”. The Congress President concluded her speech by once again congratulating the Chief Minister, his colleagues, Congress workers and the people of Assam. Narrating the achievements of the Congress-led Government in Assam Sonia Gandhi said, “There has been a marked improvement in the condition of roads while there has been increased investment in the power sector. Eight lakh BPL families have been provided with electricity under Rajiv Gandhi Grameen Vidyutikaran Yojana. Several new schemes have been undertaken for empowering women like strengthening of self-help groups and under Panchayati Raj women were given reservation of 50 per cent. “For the development of all sections of society including SC/STs, backward castes, indigenous communities, the government has set up eight autonomous councils and 18 development councils. Assam has also taken full advantages of National Rural Health Mission. I have been told that the people are receiving much better health care and facilities,” added the Congress President. Congress President and UPA Chairperson Sonia Gandhi attended the first anniversary celebrations of the third term of the Congress government in Assam. She congratulated Tarun Gagoi government in the state for the all round development and prosperity in the state. Sonia Gandhi said that today is a day of celebration for the Congress party. 'But at the same time we realise the huge responsibility the people of Assam has reposed in us and we renew our pledge to serve them better to take them on the path of peace, development and prosperity’. “I am very happy to be here in Assam and this occasion is more memorable as we celebrate the first anniversary of the third Congress-led government under the leadership of Taru Gagoi in the state. This proves that the people’s faith has increased in our government. We also realize that now we have increased responsibility to do more service for the benefits of the people” added the Congress President. Congress President Sonia Gandhi, as UPA chairperson, was instrumental for the Right to Information and the National Rural Employment Guarantee Act which were the most acclaimed policies of the UPA 1 which had a great influence in UPA’s victory in the 2009 parliament elections. She was the chief advocate for the Right to Education Bill and now UPA is ready with the food Security bill, the brain child of Sonia Gandhi. A delegation under the banner Pension Parishad delegation, led by Aruna Roy and Baba Adhav, of old-age pensioners met with Congress President and United Progressive Alliance (UPA) Chairperson Sonia Gandhi in New Delhi to seek her support for the demand for a universal old-age pension and increased monthly financial support. The delegation which included Naza Bai (75), a rag-picker from Maharashtra, Rukma Bai (80), a daily wage earner from Rajasthan, and Ram Kumar Gupta (75), a fruit-seller from Delhi, told Sonia Gandhi how their limbs were giving way, making it difficult for them to earn a living. After giving a patient hearing to them, the Congress President admitted that the change in the family pattern had put elderly people at a disadvantage, and agreed that something had to be done urgently to address this problem. Sonia Gandhi, who also heads the National Advisory Council, reportedly supported their demand for a universal old-age pension, the coverage of beneficiaries by a set of exclusion criteria, and the need for raising the pension. Admitting that the monthly payment of Rs. 200 to those above 60 was far too low, Sonia Gandhi assured the delegation that she would put in her efforts to get them a better monthly pension. "I know these are difficult times but this is no reason to feel depressed. We faced a lot of challenges in the last year inside and outside the Parliament,” she added. Talking about the future programmes of UPA, such as Ajivika, she said, "It will give boost to the efforts of the self help groups engaged in areas of women empowerment. Maternal security programmes have made their special impact." Sonia Gandhi added that the assured government purchases will encourage the business of tribal and backward people in the country. On the new schemes launched in the field of education, the Congress President said, "These have given a new opportunity for empowering the backwards in real terms." Expressing hope for a better future for farmers and labourers, she said, "The funds given to the farmers have become stronger and programmes like Aadhar will help in ensuring more benefits to the poor people." Congress President and UPA Chairperson claimed that only Congress treats everyone equally. While speaking at a huge public rally in Moradabad, also known as brass city, as part of her recent campaign for Congress in the last UP assembly polls, Sonia Gandhi had explained various welfare schemes implemented by the Congress led central government. Informing the people about the relief package for the farmers designed by the Congress led Centre, Sonia Gandhi said, “When the poor farmers were struggling because of huge debts, the UPA Government helped them with a scheme to waive off their loan worth more than Rs. 70,000 crore. But due to the wrong policies of the state Government the farmers in UP could not avail its benefits. We increased the procurement prices to help the farmers”. “There is no shortage of fertilizers at the Centre and it sent fertilizers to UP, too. But because of the corrupt distribution system by the state Government, the farmers are not able to get adequate fertilizers in UP,” informed Sonia Gandhi. “We will have to change this situation. We should bring back the lost glory of Uttar Pradesh. We want to ensure a good future for the youth in the state. We want to free Uttar Pradesh from the evils of corruption, crime and injustice. We want the youth in the state live with pride,” said the Congress President. Focusing on the issues concerned to the the famous brass industry in Moradabad, Sonia Gandhi said, “Apart from various other issues, we (Congress) also understand the problems being faced by the people engaged in the brass and carving business. Our election manifesto has addressed this issue and we will work towards to find a solution. We will work with commitment and devotion to fulfill our promises”. “I am here to seek your support to accomplish the mission of Congress to change the state of affairs in Uttar Pradesh,” urged the Congress President. Congress President and UPA Chairperson Sonia Gandhi sent a "Chadar" to Ajmer Sharif as an offering at the revered shrine of Sufi saint Khwaja Moin-ud-din Chishti's dargah on the occasion of Urs. The Dargah is hosting the religious fair or "Urs" marking the 800th death anniversary of the Sufi saint. Millions of devotees from all across the world visit the saint's shrine during the Urs ceremony. Moin-ud-din Chisti is believed to have been born in 1142 AD. Since his ancestors belonged to a town named Chisti, people began calling him by that name. Chisti, who preached tolerance and unity of all religions, died in Ajmer where his tomb has become a shrine for millions of people. In 1236 AD, the saint entered his cell to pray in seclusion for six days, at the end of which he died. Since then Urs has been celebrated for six days every year. It is believed that praying at the tomb of the saint fulfils a person's wishes. Since 1998, Sonia Gandhi has been the Congress President. Sonia Gandhi, being the leader of the Congress party, is managing the affairs in a quite commendable manner without making any noises or public outbursts. She had personally experienced the life and style of great political stalwarts like Indira Gandhi, with whom she had a special relationship, and husband Rajiv Gandhi, who had placed India to the list of fast growing nations. The nation saw an efficient leader of opposition in Sonia Gandhi when NDA was in power. Today India has a strong standing in the field of Information Technology throughout the globe and the credit goes to Rajiv Gandhi. “He raised the confidence of the nation. He emphasized on the role of technology, Information Technology in particular. I think he showed to the world that he had a dream, he ‘too had a dream’ as he said. We all got enthused by seeing a young, idealistic and dynamic person. Rajiv Gandhi was one of the two people whose death invoked great sentiments in me because he was Young, dynamic and he had a vision for India for the future. He was an extraordinary leader and I think we all are going to miss him. I wish he had lived longer, says Narayan Moorti, founder , Infosys. Decades before, Rajiv Gandhi had imagined the world of today. During his tenure he initiated a lot of programmes for the progress of technology. He laid stress on the development of fields like Space research , Nuclear research , Genetic Engineering , Genetic Biology and Computer software development. Rajiv Gandhi had the conviction to change his dreams into reality. He wanted to development initiatives to be treated like a mission and so all his targets were his missions rather. Rajiv Gandhi’s emphasis on Panchayti Raj explains the fact that he believed that in a country like India or for that matter any country the real power ,be it political or administrative, cannot be fully tapped and democratized without women. Rajiv Gandhi was not only interested in the technological development of the country but he had equal interest in maintaining the national culture. He wanted the structure of development to be uniform and in sync with the national culture. Today on his Martyrdom day, Nation salutes the visionary. New Delhi: The nation paid homage on Monday to former Prime Minister Rajiv Gandhi on his 21st death anniversary. President Pratibha Patil, Vice-President Hamid Ansari, Prime Minister Manmohan Singh and Congress President Sonia Gandhi were among the first to pay floral tribute to the late leader at “Veer Bhumi”, the memorial of Rajiv Gandhi. Rahul Gandhi and Priyanka Gandhi Vadra also paid floral tributes to their father who was assassinated on May 21, 1991 at Sriperumbudur in Tamil Nadu during an election campaign. Priyanka Gandhi’s husband Robert Vadra was also present. May 21st will be observed as Anti-Terrorism day to commemorate the death anniversary of former Prime Minister Mr. Rajiv Gandhi. On his way to address an election meeting he was garlanded by many school children and party well wishers. Assassin Dhanu got an opportunity to mix with the crowd and execute her merciless, treacherous plan. Rajiv Gandhi’s murder had left the whole nation in shock and emotional outburst. Since then, the day is celebrated as Anti-terrorism day in the honor of our former Prime Minister. Terrorism is the most brutal form of crime that human beings can ever commit; it has also become a fear factor for Indians and the world. The purpose of celebrating this day every year is to keep our youth away from indulging in such wrong activities risking their lives along with risking lives of several other innocent people. The responsibility of driving this fear out of our society solely lies on our shoulders. On the day, people are made aware of heinous terrorist activities and their after effects on the society. Rajiv Gandhi used to say that he has a vision to see India at the pinnacle of her glory and march forward as a country knitted in the fabric of democracy. He was always concerned about the delivery system and he used to say that funds earmarked for rural development hardly reach at the grass roots. He aimed at rectifying this flow and Panchayati Raj in an effective manner was his brainchild. In the field of agriculture, new advances have been made with modern set of equipments and a supportive technology for optimum utilization of resources for maximum output. If India today is at the threshold of being a great economic power, a resurgent middle-class with a great purchasing power, we have to acknowledge the lead role that Rajiv Gandhi had played. He will always be remembered with love and respect. He has made his place in history as a man who led the break-through of India into a vibrant global economic power. 21st May 1991, Sri Perumbudur was rocked by a blast. Suicide attacker had succeeded in their evil motives. They snatched away Rajivji from us and the progressive movement of a developing nation was brought to a screeching halt. This was an international conspiracy, that many top world leaders were afraid about. The then Palestinian President Yasir Arafat had serious concerns about such an attack on Rajiv Gandhi and so he had also warned him. 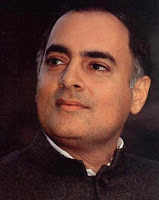 It was Rajiv Gandhi’s modern vision that made India one of the leading fast moving countries in the world. Today we hear the success stories of many IT giants like Infosys, TCS and Wipro but this could not have been possible without Rajiv Gandhi’s long term vision. Rajiv Gandhi’s concept of modernisation was not just modernization of industry but more fundamentally modernisation of minds and attitudes. He wanted the scientists and technologists to work and solve the problems relating to water-management and improved sanitation so that the people particularly in the rural areas get a better quality of life. 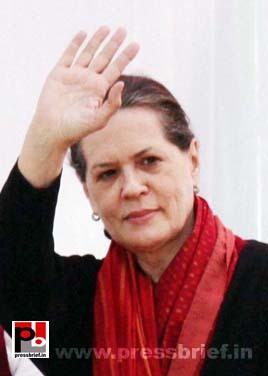 Sonia Gandhi played a phenomenal role as the Chairman of the National Advisory Council, which was instrumental for the Right to Information and the National Rural Employment Guarantee Act which were the most acclaimed policies of the UPA 1 which had a great influence in UPA’s victory in the 2009 parliament elections. She was the chief advocate for the Right to Education Bill and now UPA is ready with the food Security bill, the brain child of Sonia Gandhi. Congress General Secretary Rahul Gandhi who had visited Chhattisgarh to attend a Congress training camp on Friday told the Congress workers to work as a single unit to ensure victory for the party in the next Chhattisgarh assembly polls. "If we want Congress to win the upcoming assembly polls, then we need to stay and work together," he said. Rahul Gandhi added that only those leaders who are working at the grass root level, will be given tickets in the upcoming polls. “The UPA government is sending more funds to Chhattisgarh as compared the erstwhile NDA government, but due to corruption the money is not reaching to the beneficiaries”, added the Congress General Secretary. Asking the youths to come forward to dethrone the BJP government in Chhattisgarh, Rahul Gandhi said that the party workers should go to villages to tell people about the development work being carried out by the UPA government. Since 1998, Sonia Gandhi has been the Congress President. Sonia Gandhi, being the leader of the Congress party, is managing the affairs in a quite commendable manner without making any noises or public outbursts. Sonia Gandhi has transformed herself as an able politician, and has proven her ability to control the party from behind the scenes and without drawing too much attention to herself, and effectively maintaining a perfect balance between the party and the government. Sonia Gandhi has transformed herself as an able politician, and has proven her ability to control the party from behind the scenes and without drawing too much attention to herself, and effectively maintaining a perfect balance between the party and the government. It was under her leadership the UPA was formed. Sonia Gandhi handled the process by reaching out to other political parties in a quite appreciable manner without claiming any credit. It was a surprise even for her political opponents when the Congress President refused to lead the coalition and made Dr Manmohan Singh, the first Sikh, the Prime Minister. Under her matured leadership the Congress led UPA could retain the power in the 2009 general election, but again she chose to be silent and continued her mission as Congress president and UPA chairperson. Sonia Gandhi has been the Congress President Since 1998. She being the leader of the Congress party is managing the affairs in a quite commendable manner without making any noises or public outbursts. She had personally experienced the life and style of great political stalwarts like Indira Gandhi, with whom she had a special relationship, and husband Rajiv Gandhi, who had placed India to the list of fast growing nations. The nation saw an efficient leader of opposition in Sonia Gandhi when NDA was in power. Congress President and UPA Chairperson Sonia Gandhi, while speaking on the occasion of the 60th anniversary of India's first Parliamentary session on Sunday, said that that the Parliament should be a source of justice and compassion. “It should be our resolve in the years to come to make sure that this great institution embraces not only the triumphs and joys of this land, but rids our people of the sorrows and sufferings that still blight their lives. This great institution must be not only a source of law and power, but also of justice and compassion,” said Sonia Gandhi. Concluding her speech, the Congress President said “Three simple words spoken by Jawaharlal Nehru encapsulate the mighty mission of this great republic –"Swaraj for all". Let us, each of us, gear ourselves up for the tasks ahead, renew and redouble our commitment and our pledge to fulfill our historic duty”. Congress President and UPA Chairperson Sonia Gandhi spoke on the occasion of the 60th anniversary of India's first Parliamentary session on Sunday and paid homage to great national leaders and also paid tributes to the persons killed during 2001 terrorist attack on Parliament. Addressing the staff in the Parliament, the Congress President said “We also gratefully acknowledge the contribution of thousands of hard working staff in Parliament who have toiled tirelessly to keep the wheels of this great institution moving efficiently”. Recalling the Parliament attack, the UPA Chairperson said “And, we pay humble tribute today to the memory of those courageous heroes who laid down their lives in 2001 when Parliament came under attack by forces that seek to undermine our Constitutional democracy”. “The journey of our great Parliament has not always been smooth or without challenge. Nor did we expect it to be. An anniversary is also a moment for reflection, to consider our role and place in the rich fabric of our nation’s life and history”, she asserted. Sonia Gandhi emphasized that the integrity and independence of Parliament must be preserved and protected at all cost, with no room for compromise. “Our conduct must rise to the highest ethical standards that were followed and demanded by the founding fathers of our nation” she added. Congress President and UPA Chairperson Sonia Gandhi spoke on the occasion of the 60th anniversary of India's first Parliamentary session on Sunday and paid homage to our great national leaders like Mahatma Gandhiji, Jawahar Lal Nehru and Dr BR Ambedkar. Sonia Gandhi said “I pay my deepest tribute to the Mahatma. He was no longer living when this House first met, yet he was the guiding light that made it all possible. Leading a life of spartan simplicity he dedicated himself to the last and the least. He taught us the power of love and compassion”. “I pay homage to Jawaharlal Nehru, his comrades-in-arms and political colleagues too numerous to mention, whose profound belief and single-minded determination gave spirit and substance to the idea, the functioning and the nurturing of our Parliament through its formative stages. I pay homage to Dr. BR Ambedkar who accomplished an immensely difficult task to create the constitutional frame on which our democracy stands”. She continued remembering the contribution of various MPs and said “ pay tribute to the peerless giants, the legendary figures, who have graced our Parliament. They built great parliamentary traditions and endowed the nation with vision and direction”. “They created new rights and remedies for all our citizens and have especially protected the excluded and the marginalized,” Sonia Gandhi added. Congress President and UPA Chairperson Sonia Gandhi spoke on the occasion of the 60th anniversary of India's first Parliamentary session on Sunday. “Again and again, they have voted with wisdom and purpose, sometimes reaffirming their faith in those who govern them, sometimes voting them out. If there is one thread running through these past six decades, it is that people's power is felt constantly at the highest levels of governance. The aam admi has become the heart and soul of our democracy and has made it our greatest triumph”. “India’s freedom struggle reinvented the idea of democracy. "My notion of democracy", said Gandhiji, the Father of our nation and the leader of our freedom struggle, "is that under it the weakest should have the same opportunity as the strongest," commented the UPA Chairperson. “Sixty-five years ago at Independence, India awakened "to life and freedom", with a bold and ambitious vision – a vision to build a legislature on the basis of universal adult franchise. At one stroke, millions of our poor and illiterate, men and women, were given the power to change their destiny” said the Congress President beginning her address. “Let us not forget those troubled days and months and the numerous challenges the country faced then. Millions of refugees were homeless. Communal tension was rife. Destitution was rampant. Borders were tense. Resources were scarce. The very idea of India, let alone the idea of a democratic India, was being ridiculed in many quarters. When far older democracies had achieved universal adult franchise in a gradual process and after long decades of struggle, how could it become a reality in a new nation beset with such problems?” added Sonia Gandhi. Sonia Gandhi continued “To their eternal credit and our undying gratitude, our founding fathers persisted. The poor and illiterate masses of this country have turned out to be amazingly skilled and sophisticated. Congress president Sonia Gandhi on Sunday said during the discussion in the Lok Sabha to mark the 60th anniversary of parliament said that India's freedom struggle reinvented the idea of democracy and also recalled our father of nation Mahatma Gandhi's vision that the weakest should have the same opportunity as the strongest. "We can say with pride that India's parliament, elected by the largest electorate in the world and reflecting the aspirations of some 1.2 billion people, has grown into a great representative political institution," she said. Sonia Gandhi said that B.R. Ambedkar accomplished an immensely difficult task to create the constitutional framework on which the country's democracy stands. The Congress MP then recalled the contribution of Members of Parliament over the past sixty years and said: "They created new rights and remedies for all our citizens and have especially protected the excluded and the marginalised. Indian social legislation has today emerged as a global benchmark." Acknowledging the contribution of thousands of hard working staff in parliament, Gandhi paid tributes to those who laid down their lives in the 2001 terror attack on the seat of Indian democracy. While concluding her address Sonia Gandhi recalled Jawaharlal Nehru's words "Swaraj for all", and commented that these encapsulated the mighty mission of this great republic.